This is a lovely Bible. 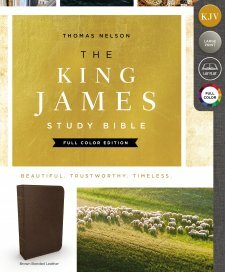 There are so many wonderful features to it and I've truly enjoyed using it in my devotional and Bible study time. First thing I love is the size of the font. It's not so small that you have trouble reading it. It's much easier on my eyes and I'm able to keep reading without problems. The study notes are a bit smaller, but again, they are much larger than other study Bibles I own. The colored pictures bring the Bible alive! There are pictures of places, (i.e., Athens, Island of Patmos, Smyrna, etc. ), as well as maps, paintings, drawings and more. Each book of the Bible also starts with a colored picture so it makes it easy to find each book. The study notes are detailed and really helped me to understand the Scripture I was reading. There are also different indexes in the back that cover the teachings of Christ, the parables of Christ, the miracles of Christ as well as other detailed things that give you a wonderful over all understanding of the Bible. I really liked it because I was doing a specific word study and this helped me to go to each Scriptures and tie them together. There are also lovely maps in the back, too. The fact that one of my professors from Liberty University, Howard Hindson, is the general editor, gave me great confidence that the study notes and other study materials within are accurate and done with utmost care. I highly recommend this Bible! I have come to depend on it as I do my studies because it gives me so much information right at the end of my fingertips. I highly recommend it and give it 5 out of 5 stars.